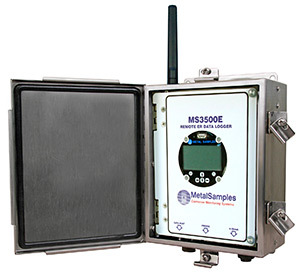 The MS3500E is a battery-powered, intrinsically safe, remote data-logger capable of measuring and storing data from all types of electrical resistance (ER) corrosion probes. The instrument is microprocessor-based and features a simple, menu-driven interface. Corrosion rate measurements are made using a high-resolution electrical resistance method, measuring up to 65535 probe units. Essentially, the instrument measures the resistance of the probe element which changes over time, as metal loss occurs. The rate of change is directly proportional to corrosion rate. This method finds a wide variety of applications since it can be used in conductive and nonconductive environments such as petroleum, chemical, water, soil, or even atmosphere. The MS3500E takes probe readings on a user-programmable logging interval. Readings are time and date stamped as they are taken, then stored to memory. Between readings, the instrument remains in a “sleep” mode to conserve main battery power. The instrument’s memory is capable of storing more than 100,000 readings, and is stored in non-volatile Flash memory. Stored data can be downloaded directly to a certified USB storage device or via Bluetooth (option on Model MS3520E). This eliminates the need to remove the MS3500E from its site, or to bring a laptop PC to the site. This can be particularly useful when collecting data from multiple MS3500E Data Loggers. And since the MS3500E is intrinsically safe, data can be downloaded from the MS3500E even in hazardous locations. The MS3500E also offers an optional 4-20mA current loop output. This feature allows data from the instrument to be fed directly to any industrial process computer that accepts analog inputs. The instrument is housed in a stainless steel NEMA 4X / IP 66 enclosure, and all external connections are weather-proof. This makes the MS3500E suitable for use in almost any indoor or outdoor environment.